Kirana Gharana holds a very special place amongst the traditional styles of North Indian Classical vocal music. Widely recognized to be founded by Ustad Abdul Karim Khan (although opinions differ amongst the musicologists) from the village of Kirana (or Kairana) near Muzaffarnagar in Uttar Pradesh, Kirana gharana has given us several excellent performers of the Khayal style of singing including masters like Pandit Bhimshen Joshi, Pandit Rasiklal Andheria, Ustad Amir Khan, Ustad Mashkoor Ali Khan and many others. Kaivalya Kumar’s grandfather Pt. Ganapatrao Gurav was a first batch disciple of Ustad Abdul Karim Khan. Kaivalyakumar’s father and guru Pt. Sangameshwar, trained by Pt. Ganpatrao, was well known for singing in the true Kirana tradition. And Pt. Sangameshwar in turn has groomed Pt.Kaivalyakumar into an outstanding vocalist of the current times. Ironically, during the early part of his life, Kaivalya Kumar tried hard to avoid a career in music. Discouraged by his father’s moderate success in the profession, Kaivalya educated himself for a career in business, and engineering. When none of these gave him the satisfaction he was looking for, Kaivalya Kumar turned to his roots in classical music and surrendered himself to rigorous training under his father. And within a short period of time, Kaivalya established himself as a grade “A” artist of All India Radio and Doordarshan at an age of only 35. Now Kaivalya Kumar is one of the most sought after artists in India. 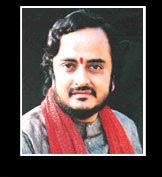 A great singer of Khayal, Pt.Kaivalyakumar also renders Marathi Natya Sangeet and Abhang, Bhajans, Kannada Vachana and Dasara Pada with equal finesse and all of which has won him the acclaim of listeners and critics alike all over India and abroad. Pandit Kaivalya Kumar is a leading young exponent of the Kirana Gharana with a rich multigenerational lineage. He was trained by his father Pandit Sangmeshwar Gurav. His Grandfather Ganpatrao Gurav, studied under 2 legends: Pandit Bhaskarbua Bhakle and Ustad Abdul Karim Khan. Due to this ancestry, Kaivalya Kumar is a treasure house of unusual compositions (Bandish). Pandit Kaivalya Kumar Gurav hails from Dharwad, Karnataka. He was initiated into classical music by his father Pandit Sangameshwar Gurav. Endowed with a mellifluous, fluid and high pitched tenor voice, he has achieved much recognition- "Surmani", " Pt. Jasraj Gaurav Puraskar” and "Sarva Shreshta Kalakar" to name a few. He has performed at several prestigious music festivals in India and has several albums to his credit. Young as he is, (born 1963 at Belgaum, Karnataka state) Kaivalya Kumar is a B.Com, B.A and Gold medalist at M.A. Music, all from Karnataka University Dharwad. He took to music, quite early in his career, as naturally as a fish takes to water. He is a third generation musician. His grandfather Ganapatrao Gurav was a disciple of Ustad Abdul Karim Khan, the founder of Kiraana Gharaana. Pt. Sangameshwar. Kaivalya Kumar’s father and guru is a well known exponent of the Kiraana tradition. His father has groomed Kaivalya Kumar into an outstanding vocalist. Gifted with a naturally high pitched, mellifluous voice, Kaivalya Kumar’s rendition of ragas is marked by natural phirat, fast tans, infallible rhythm, imaginative content and a superb aesthetic approach. Even within a short space the article has repetitions and contradictions.